It would be easy to downgrade everything in life for comic affect, and many of our best comedians do just that. When I told people I was heading to Moldova, several people mentioned Tony Hawks’ extremely funny book “Playing the Moldovans at Tennis”, as if this was a documentary about life in Moldova. At the start of the book, England beat Moldova 4-0 in a European Championship qualifier; which means I can date the first chapter to September 1997, and therefore understand that the rest of the action took place later that year. A lot of progress can occur in 13 years in a newly independent country, even if situations such as Transnistria remain unchanged. So to start with the simple points  the streets are lit (sometimes poorly), and this light is added to be the neon blare of dozens of small casinos. There were some uneven pavements, but no missing manhole covers  the greatest risk when walking down the road is where some railings or other fencing have been removed leaving a short and rough metal stub, which could trip or even maim the unsuspecting passer-by. At no time during the trip, did we feel uncomfortable walking on the streets. We found a variety of eating and drinking establishments, and were welcomed by all. At one point in the book, Hawks makes his way to Orhei (because he decides he cannot be bothered to change bus to Orhei Vecchia). We made the trip to Orhei intentionally, (the side trip to Vecchia still being awkward by public transport), and found it to be a pleasant enough place, with some rather poignant memorials, a pretty church, a café that sold excellent pastries, and of course a recently refurbished football ground. Apart from some half decent football, what else could we ask of a small town that one does not intend to spend more than six hours in? St. Stefan cel Mare (the Great) is featured prominently across the country. In this case we see him outside municipal buildings in Balti. The basics  Paul and I travelled to Chisinau using Austrian Airways, although one of the planes was Air Moldova with a code share. On the outward journey, we had only a short time to change flights in Vienna, but this went smoothly, despite a delay of more than 30 minutes at Heathrow. On the return, we were supposed to be stuck in Vienna for a long time, but this was shortened by delays in Chisinau. There are few direct flights to Moldova from the UK, but there are also routes via Germany and Romania. If using the latter, and flying out to Bucharest via Wizzair, then one has to switch airports in Bucharest, a factor in our decision not to fly that way. On arriving in Chisinau, we avoided the taxis touting for business and instead took a microbus from a compound at one end of the concourse. This took us to one end of Boulevard Stefan cel Mare (which is the main street of Chisinau) for the princely sum of 3 Lei (18 to the £). For accommodation, we rented an apartment, two rooms, each with a double bed, plus kitchen and bathroom for 35/night (payable in cash and in Euros). The apartment we rented can be found at www.homeservice.md  we had some help in arranging the booking from Oliver, (publisher of Groundhopper-Informer), whose wife is Moldovan. We were met in Chisinau by Oliver’s sister in law, Christina who was very helpful in arranging for us to meet the operator of the apartment. Andriy, who booked us into the apartment, later became our driver, taking us to and from the Sheriff ground (45 Euro), and also taking us back to the airport at the end of the stay (100 Lei  about £5.50). The Moldovan Football League is arranged with two national divisions, the top one being called Divizia Nationala and the other being Divizia ‘A’. The next level, split into three regions is called Divizia ‘B’. Fixtures, results and league tables for all can easily be found on the FA’s website, www.fmf.md  both the Nationala and ‘A’ divisions have 14 teams, although 6 of those in the lower division are in fact reserve teams. Oddly, there is only one reserve team in the ‘B’ Divisions. Only one of the reserve teams (Dinamo Bender) appear to have their reserve matches listed at the same venue as the first team, although several use secondary (and generally artificial) pitches on the same complex. Olimpia-2 Tiligul is the reserve team of Olimpia Balti, but their home base is about a two hour drive south of Chisinau, while Balti itself is a two hour drive north! The Moldovan National Division was formed in 1992, following the country becoming independent from the USSR. 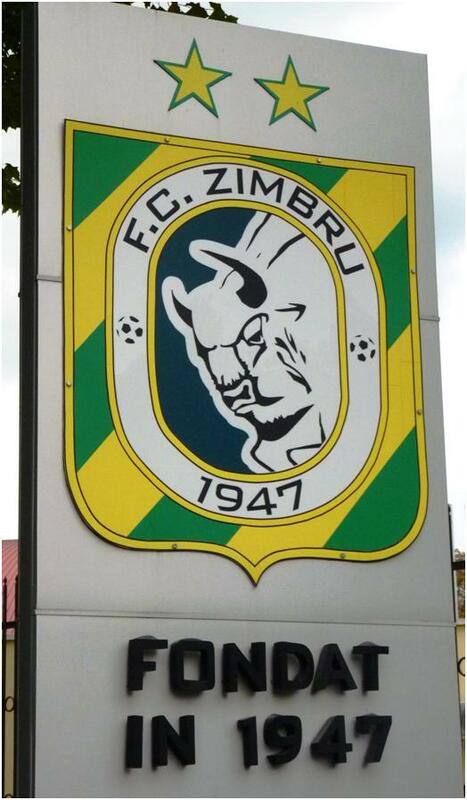 During the first nine seasons, Zimbru won the league eight times, while since then the title has been firmly situated in Tiraspol, in the hands of Sheriff. The only other title winner, in 1997, was Constructorul  then a Chisinau club, but now renamed as FC Tiraspol and sharing the ground with Sheriff. Sheriff themselves were only formed in 1997 and quickly established themselves as the major team in the capital of Transnistria. Prior to Sheriff, the top club there was Tiligul-Tiraspol who finished runners-up on six occasions, but finally folded in 2009, having lost their support to the new boys. As a general rule, the top two divisions play their matches on different days of the weekend, either Saturday/Sunday or Friday/Saturday – with a lack of certainty as to whether the top division fixtures are the day before or after the lower division. ‘B’ Division games are mainly Sunday. Most games kick off in the afternoon, with the kick off time sliding backwards as autumn sets in. The first set of fixtures of the season kicked off at 18.00, while our games at the start of October were 15.00 and as the winter break approaches, 13.00 is used. Of the four stadiums I visited, three had floodlight pylons, but two of these were not fitted with lights. Zimbru has floodlights, while Sheriff has lights (attached to the roof of the stand) but no pylons on the primary stadium, (the second stadium of the complex has lights on pylons). 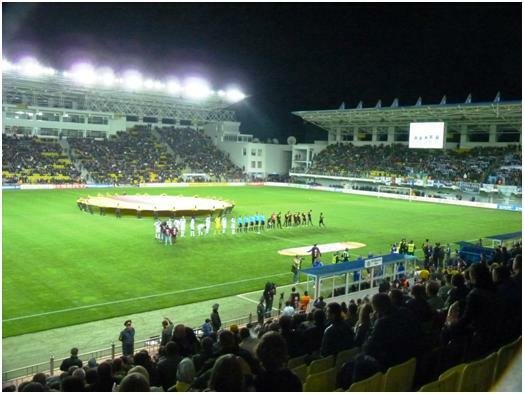 Matches in Tiraspol generally take place around three hours later than the rest of the fixture list, allowing the possibility of doubling a game here with one at Dinamo Bender on the same day. As getting to Tiraspol involves crossing the unofficial Moldova-Transnistria border, only Bender, which is also in Transnistria could be paired with Tiraspol. 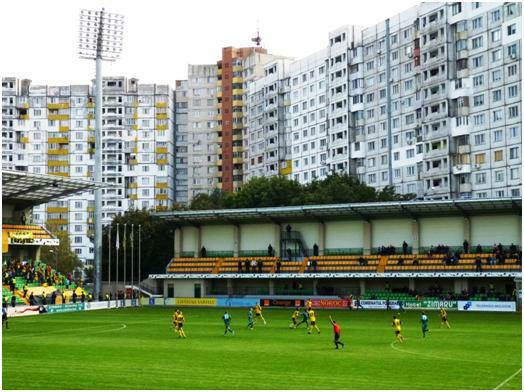 Occasionally, Zimbru, or Dacia (currently sharing the stadium) also play in the evening  allowing a double header with another team in the Chisinau area, Academia, Rapid, Sfintul Gheorghe or Gagauziya. For those trying to learn Romanian, Sfintul Gheorghe translates as Saint George. 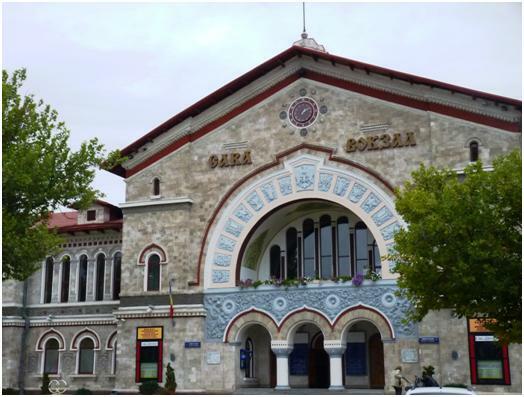 Gagauziya is in fact a territory to the south of the country, with a degree of autonomy, and a desire to be independent. 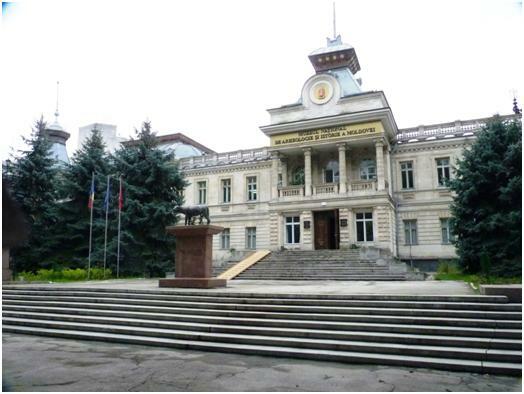 The football team played in Comrat, the capital of the region last season, but on being promoted, they have moved to share Suruceni (just outside Chisinau) with Sfintul Gheorghe. A word of warning to those travelling to the country. Most fixtures will take place on the dates given months in advance on the website, but on any given weekend, it is possible for some matches to be changed late in the day. For our trip, the Zimbru-Sheriff game was switched from Saturday to Sunday about two weeks before the fixture  but another match, at Olimpia Balti was only switched to a new date after we had left England. One needs to check via either the internet or the local papers when in the country. I took my PC with me, and had no trouble finding WiFi in local cafes in the capital. There were also internet cafes around. We did not buy a paper, but spotted at least one sports daily, in Cyrillic. Most Moldovans speak both Romanian (according to actual Romanians, with a “country accent”), and Russian and newspapers can be in Romanian (with Roman characters), Romanian (Cyrillic) or Russian (also Cyrillic). With the Thursday match at Tiraspol (see previous posting) finishing only just before midnight, and a 20 minute wait on the border, it was about 2 a.m. before we hit our beds. Hence we decided that Friday would see us choose a local match in the ‘A’ division. We had CSCA-Buiucani in mind, as at least they were supposed to be playing on a ground of their own, rather than playing on an artificial surface next to another pitch. Fortunately, the next morning we elected to take a coffee in a nearby café with WiFi, so as I could check e-mails and web sites. Two things immediately showed up, Buiucani were not using their own ground, but had switched to their opposition, (Zimbru’s second team, on Zimbru’s second pitch), while in the top division, Olimpia Balti had changed their fixture from Saturday to Friday afternoon. Balti’s other club, Locomotiva had switched their ‘A’ division match from 15.00 to 13.00 kick off. Balti was already one of our options for the Saturday game anyway. So we quickly paid up at the coffee shop, and returned my computer to the apartment. We asked the first taxi we saw to quote as a price to Balti, and we told 650 Lei (around £35) for the two hour ride. I know we could have tried to haggle, but we simply accepted the price  asking that he stopped at an exchange place on the way out of town so as we could pay in local currency. A second stop was made at a petrol station and then we were on our way. [We had to show the taxi driver the place on the map  the place is pronounced Beltsy; and we were saying it as if we were ordering Indian food]. There were some souvenirs on sale when we got to the ground, and we could have bought scarves with the club name in Cyrillic, or spelled Beltsy in Roman characters. One odd incident, about 30 minutes out of Chisinau, we saw a coach parked roadside with the Olimpia Balti logo painted on it. There were a few people milling around after the bus. Knowing that Balti’s reserve team were based in the south, and were playing away in Balti; our first thought was that it could be the reserve team bus, and it had broken down. However, just after we arrived in Balti, we saw the same bus arrive at the Olimpia Stadium, and the players getting off. My only conclusion is that the team (or at least a fair portion of them) live and train in Chisinau even if they represent Balti. 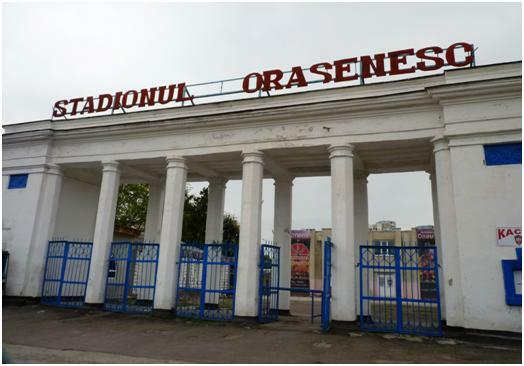 Moldovan Football Grounds appear to have good gateways  this is the entrance to Orasenesc in Balti. It was shortly after one when we arrived in Balti (pronounced Beltsy), so we did not try to see the Locomotiva game. With 1.8 km between the grounds, I felt we could have happily paired the matches, while Paul never really fancied the idea. Not going to the other game gave us plenty of time to look around the town. This is a pleasant enough place, even if there is little in the way of things to see. 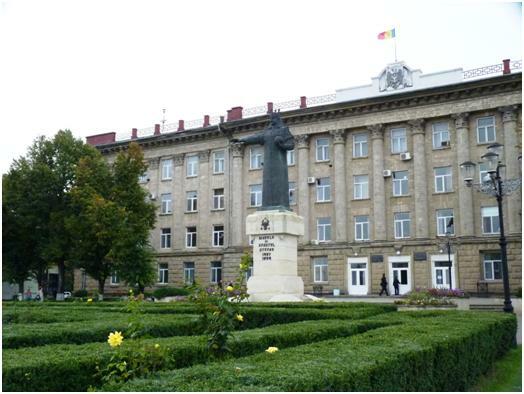 The main round, as in Chisinau is called Stefan cel Mare (Stephen the Great), and a memorial to this fifteenth century (sainted) hero stands in the centre. The Main Stand at Olimpia Balti. The home team in Red, Nistru Otaci in Blue. The football ground shows its age from the moment one enters. The gateway itself has lost part of a letter from the name Stadionul Orasenesc, and some of the paint on the ornate entrance is peeling. Inside, plastic seats have been attached to the stands on either side of the ground, while what is left behind the goals is just support for wooden benches long since rotted, and hence unused. There is some cover to a central section upper deck, but this was not accessible to the general public, so we were glad that the weather remained dry. The playing surface itself was in a terrible state, but was still usable, unlike the track that surrounded it. This had been original laid as strips of tarmac, but they have contracted leaving gaps between the lanes, and also at the start and end of the strips. We paid 10 Lei (about 60p) to get in, and the official crowd of 600 seemed about right, (the Moldovan FA publishes the match stats, including official crowd figures around two weeks after the game). As we were to discover over three games, Moldovan football can flatter to deceive, with good moves in midfield being wasted by poor crossing and even poorer heading of the ball. There was one exception to this in the 37th minute and this gave us the only goal of the game. From this angle, we can see the state of the track (which has almost as much grass on it as the pitch) and the far stand. We returned to Chisinau using the microbus. Two hours in a cramped minibus for the princely sum of 51 Lei (under £3) each. The bus took us to the North bus station in Chisinau, which is not in the North of the city. It takes its name from the fact that buses to the North go from there. We had to get a local bus into the centre when from the bus station, simply because we could not work out exactly where we were. We chose to go to Orhei the next day, and again used the microbus routes. This time we had to use the central bus station, which is near the centre of the city, and is well hidden as the market seems to extend into the streets in all directions. As we headed out of the station we passed rows of old women selling soft cheese  almost certainly having arrived by bus the same morning, and then setting up their wares at the closest spot they could find. 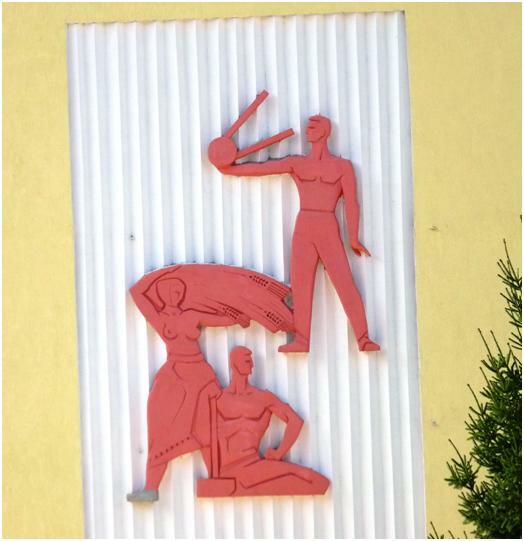 Soviet Artwork on the side of a public building in Orhei. I have already described the town above. The stadium is central, and we passed it on the way in. This is a recently refurbished stadium with all the spectator accommodation on one side. In fact, only half of this side has been fitted with plastic seats  the other half still having the bare concrete steps. A very small number of seats in the centre of the stand were under cover, but it was a sunny day, and we elected to avoid these. In contrast to the previous day, both the pitch and the tarmac running track surrounding it were in good condition. The ground also had new floodlight pylons, but in common with the old ones in Balti, there were no lamps. Another gateway  this on Orhei. The cash desks are unoccupied, although a sign on the left says admission is 10 Lei. When we went into the ground, we found that the ticket sales booth was unoccupied. We asked the gate steward where to buy tickets, but he just waved us in. It appeared that no one was paying for admission, so I assume the 700 given as official attendance was no more than a guess  and I would say about twice the actual numbers. Many of those that attended arrived late, and there was a mass exodus at half time. Some of these returned, but somewhere between 50 and 100 people less watched the second period. Just before kick-off, home team in white, Academia in Blue. You can see people avoiding the lack of admission charge, but watching through the fence, and as at Balti, the floodlight pylons contain no lamps. 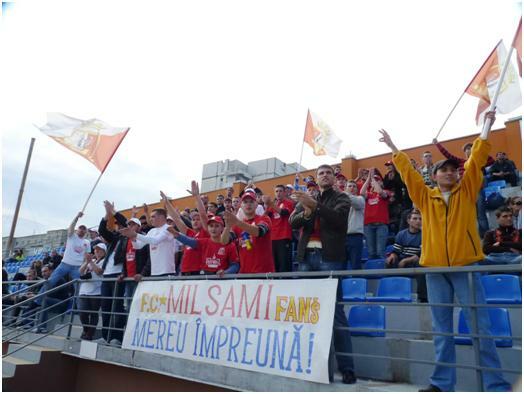 The home team were named Viitorul Orhei last season, but are now called Milsami. This is down to the club taking on new owners in the close season  the name is derived from the names of the owners. A group of fans were wearing new shirts with the new name on it, and even had the name on a banner. I got the feeling that the new owners had done their P.R. work with the regular support well. Applause from the home fans, who seem to have taken easily to the summer name change. The visitors were the Academia UTM side, up from a University in Chisinau. 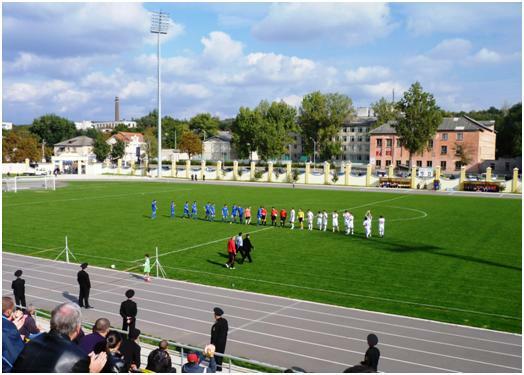 I don’t think the players are actually connected with the University, but at least the team now plays there, (last season, the first team played at the Dinamo Stadium, with only their reserves at the University). Once again, the football on show was not very good, especially when the teams got close to the goal  but we did get a goal in each half, and a final result of 1-1. Orhei  it appears that the seats are more popular than plain concrete. Our exploration of Chisinau was mainly carried out on the Sunday morning. It is an intriguing city, but one that probably has more for the resident than for visitor. The first thing one notices is the high number of casinos with flashy, neon lights just off the main road. I was intrigued enough to glance in through the doorways of one or two. What one saw inside was a few slot machines and a serious lack of customers. One might ask what type of economy involves empty casinos. If anyone comes across a legitimate answer, then let me know. Looking around, we then noticed that Casinos were not the only business notable for its numbers. The number of jewellery shops, mainly advertising that they bought and sold gold was also over the top, compared to anywhere I know, except perhaps the diamond quarter in Antwerp. Thirdly was the number of mobile phone shops  especially those for Orange. Certainly if you had the need to buy an Orange Mobile Phone, you would rarely have to walk more than a block searching for one. In the other towns we visited, the numbers of casinos and jewellers was closer to normal, but the number of mobile phone shops was equally high. Paul has an Orange mobile phone, which works over most of Europe  but did not work in Moldova, (my phone is not from Orange, but connected itself to the Orange network most of the time while we were there). 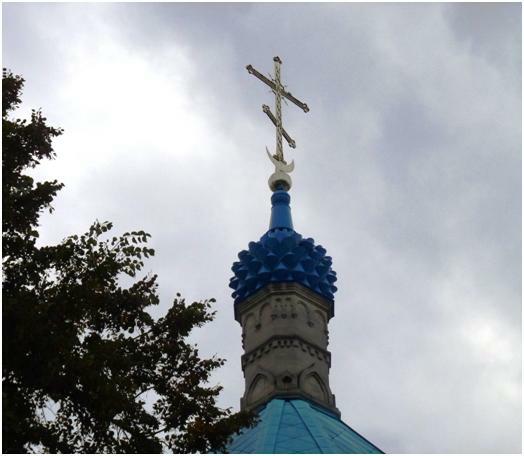 A less Orthodox Church Dome. One final feature that we could not help but notice while wandering around Chisinau that one notices was the legs. The women (and in no way limited to the younger women) of Chisinau seem to delight in showing off their legs, short skirts and high heeled shows being the fashion. They carry it well, too  which considering the uneven paving in places is quite a feat in itself. While our first couple of days in the country were warm, the weather turned cooler over the weekend, and out came the thigh high boots  still showing off legs that many Americans would pay their surgeons a great deal of money to achieve. 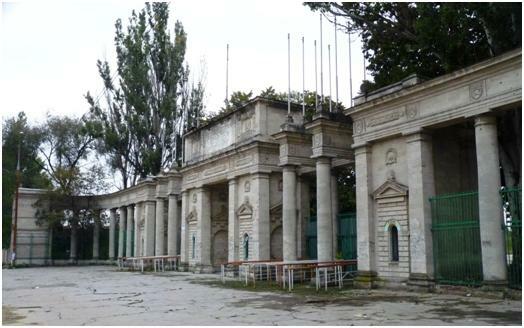 The cathedral for Chisinau is set in a park at the north end of Stefan cel Mare. 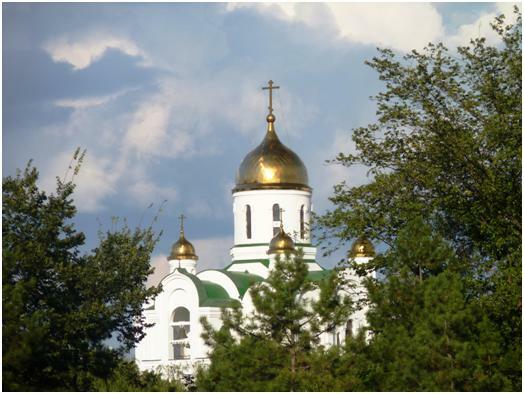 It is typical of orthodox churches in the region, and there are actually a few more picturesque examples in Chisinau and around the country. Outside the church is a copy of the Arc de Triomphe, while further up the road is a statue of Stefan cel Mare (guarding the entrance to another park), and the soviet contributions to architecture in their government buildings. We then cut across to walk back down the next parallel road  not realising that we walked close to the Dinamo Stadium without taking time to see it. The parallel road was called 31 August 1989. Paul asked what it was called before 1989, leading us to check every road sign as we wandered down, but all references to the road’s previous name had been obliterated. This was surprising, as most of the buildings here were built closes to 1889 than to 1989. The date would either appear to commemorate Princess Anne’s separation from her first husband, or just possibly the decision by the parliament of the Moldovan SSR, (still then part of the Soviet Union) to make Romanian, rather than Russia their official language. This is the sort of garden ornament I need. 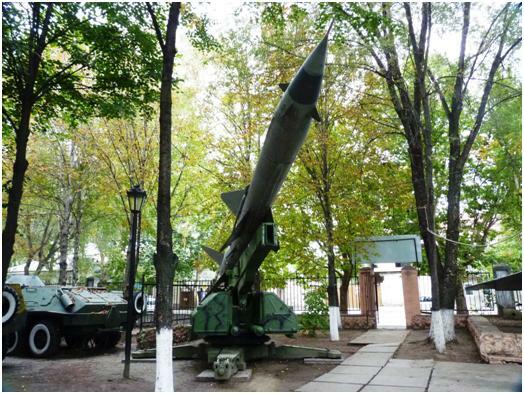 Most of the national museums seem to be housed in the older buildings on 31 August 1989, including one with a MiG fighter and a soviet missile in it’s garden. Nearby we found the ruins of the old Republican Stadium. 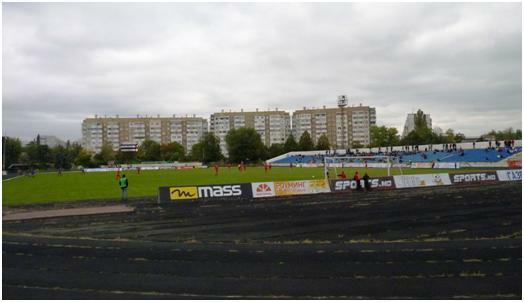 This is where England played on their visit to Moldova. The only remains of the football stadium is the gateway, although as yet no of the plans (and there have been several over time) to redevelop the site have come to fruition. We walked down from there towards the railway station, checking out a home brew pub that was to supply our food and drink later. The railway station has been done out very ornately, for somewhere that appears to only have five trains (all international routes) per day. The result is that apart from use to catch trains, it can be hired out for events. When we went past, it was being used for a wedding reception. The entrance to the old Republic Stadium. 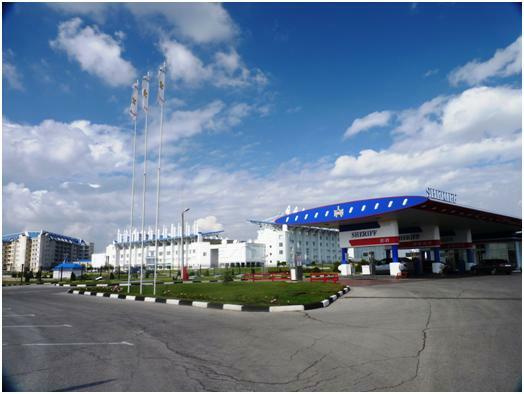 Then it was down to the Zimbru Stadium  we used a taxi for this part of the journey, but did walk back later  it was not a short walk, at least an hour from the station which itself is at one end of the town. The Zimbru stadium is a new development, opened only in 2006. Three sides are of near uniform design with the fourth side, all along one side being much more narrow. The area is residential, and the stadium is overlooked by some tall residential blocks. Currently, another Chisinau club, Dacia share the stadium and they have hung a large banner over the side of the nearest block. When we arrived at the stadium, well before kick-off time, there were crowds pushing around the ticket booths, giving the impression that tickets could be at a premium. This was however not in any way the case. The official crowd of 5000 (half the stadium capacity) was surely an over-estimate, I suspect around twice the number actually present. We bought our tickets without problem, noting that they had been put up by 10 Lei for this big match, and hence to get a good seat, we had to pay 35 Lei (almost £2). Should have settled for a cheaper variation though. If one walks along in front of the stand behind the goal, then there is someone to check tickets as you walk towards the main stand  but if you use the much wider pathways behind the stands, and enter from the far end (as we did but chance), then there is no one to check, and anyone could take any seat. 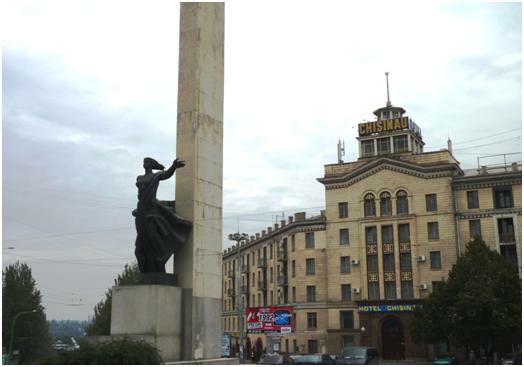 A statue outside the Hotel Chisisnau, and below, the ornate railway station. There were a couple of occurrences that highlighted the state of local football. Just before we entered the ground, a section of the home crowd had grouped together to enter the stadium. They had the flags and banners and were being faced down by quite a contingent of security police. The leaders of the band were even disguising their identity with balaclavas covering their faces. They then meekly accepted the demands of the security at the ground entrance, entering in single file and allowing themselves to be searched, (and of course, removing the balaclavas). Still, they managed a little trouble at half time. Sheriff fans had been installed in one corner of the ground and had displayed flags there. At half time one of the home fans went across and stole one of the flags. He then ran the whole length of the main stand, showing his prize and without one of the many security police stopping him. They finally intervened when the other home fans joined in and before they could set fire to the prize. Still it was not returned to its owners and did not reappear. Incidentally, there was a programme for the match. We first spotted that a few fans had programmes with them, but we could not see where they were being given away. However, soon after we found some seats, someone came out and distributed copies generally in the main stand. The programme was just one piece of A4 paper printed on both sides, arranged so as it could be folded down to A5. Most of the writing was in Cyrillic text, although the match details on the front were in Roman characters. When I got back home, I took both the programmes for Zimbru and Sheriff to a local pub in Cheltenham. He confirmed my theory that the Sheriff programme was in Russian, while the Zimbru one was in Romanian. If you need a pub landlord with Russian ‘O’ level, it pays to do your drinking in Cheltenham. You may have noticed that I have not mentioned the football much, and that is because it was not very good. I have this theory that football of roughly equivalent ability will attract similar crowds regardless of the country it is played in. 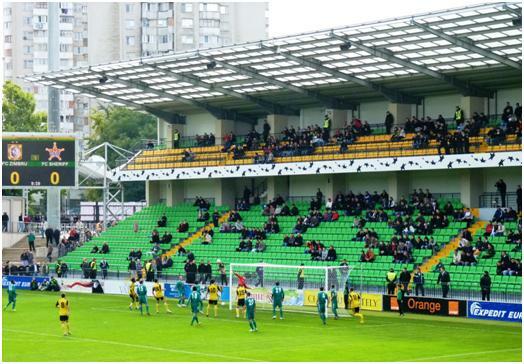 Officially, the Moldovan League has an average attendance of under 1000  and our experience suggested a gap between official and real crowd levels. I was talking to a Radio Moldova reporter during the second half. When I told him I supported a fourth level club in England, he was not overly impressed  and he certainly struggled to believe my assertion that Cheltenham would beat most, if not all the clubs in the Moldovan League  but I am certain that none of the local clubs would do well in League-2. There was in fact some reasonable football played, and two well taken goals, Abdul Razak Salifu scored for Zimbru on 24 minutes, while Serghei Gheorghiev levelled 12 minutes later. The rest of the game was rather frustrating to watch with silly mistakes, poor crosses and terrible headers making light of some good midfield play. By midway through the second half it seemed that both sides has settled for the draw which followed. Sheriff made quite a few from the Europa League match three days earlier. Some of these were forced as the Moldovan League demands at least three Moldovans start in each game. Gheorghiev was one of these three, born in Gagauziya, their goalkeeper was a local from Tiraspol in Transnistria, while the third Moldovan, and the only one that played both games was actually a naturalised Moldovan, born in Georgia. Sheriff also fielded two Serbians, and nationals of Slovenia, Russia, Bosnia, Ghana, Latvia and Burkina Fasi. Zimbru fielded nine Moldovans in the starting line up, Salifu (Ghana) was one of the foreigners, while they also fielded a Russian. The Zimbru goalkeeper was the only one person in the 18 man squad selected for the Moldova game to actually play club football in Moldova (and he was only on the bench). When Tony Hawkes played the Moldovans at tennis, most of the team played not only in Moldova, but in Chisinau itself. If he tried it again, he would find four of the starting 11 in Russia, three in Ukraine, and the others in Sweden, Poland Romania and Kazakhstan but he would not have to travel to Moldova at all. One of the questions I get asked, as “Why are you going there?” The answer I normally give is simple  “because I have never been there before”. In some cases, the journey may well be more of a challenge than others, and reading up about Transnistria on the internet before making a trip to see Sheriff Tiraspol play in the Europa League suggested that this was a foolish choice, and that we were heading to a lawless place where we would be bound to be shaken down by the crooked border guards. As lawless places go, Tiraspol is a remarkable tidy and ordered city  and the officials looking after the border between Transnistria and the rest of Moldova hardly said a word before stamping the small sheet of paper that sits inside the passport to allow a visitor 24 hours in the territory. (The 24 hours is controlled as such  my friend Paul was ahead of me in the queue, and was allowed to stay until 11.50 the next day, while I had 5 minutes longer). Once in the city, there is no feeling that there is an overbearing military presence. We walked past a barracks, but saw no other signs of the military. There were not more or less police on the roads than other countries. The people we tried to talk to were friendly and tried to be helpful, although the lack of a common language hindered communications. We had no trouble ordering coffee, food and beer  or in buying tickets for the evening game. 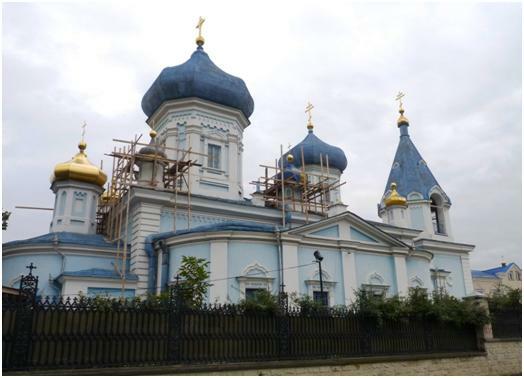 I will admit we took an easy option over crossing the border  by accepting an offer of car and driver for 45 return, we were accompanied by someone who could speak Russian  but there were no signs that there would have been difficulties anyway. The ease of crossing surprised a Moldovan Radio Journalist I spoke to in Chisinau. It certainly appears that had we applied to the football club for journalist’s accreditation, they would have passed it on to the border (and this would have caused a problem), while the journalist was surprised that tickets were on sale on the day of the game. In fact, our biggest problem was obtaining the small programme that was available for the game. This was A5 size, and mainly in Russian (we think). It was distributed (free) somewhere outside the ground, but we did not see them until we were inside. It was therefore down to our blagging skills to obtain this. I can report that both Paul and I ended up with a copy each. This brings me on to the subject of Transnistria itself. Effectively, the territory is self governing  but the only other territories that recognise its independence are those of two other ‘breakaway republics’ from the old Soviet Union. The history, as far as I can work out is that Transnistria was incorporated into the Russian empire sometime in the 18th century. Moldova was part of Romania, and hence in the Austro-Hungarian empire, and then part of Romania until 1940. After 1940, both became the Moldovan Autonomous Soviet Socialist Republic, part of the USSR. It was however one of the quickest to breakaway when the Soviet Union broke up. Under Russian control (autonomy is a name only), the west side of the Dneister river was basically an agricultural economy, while the east bank was heavily industrialised. The population of the west continued to speak Romanian, with Russian as a second language (and for a while, only Cyrillic writing was permitted), but immigration to the east gave a roughly equal split in population between Romanians, Ukrainians and Russians with Russian as the lingua franca. After independence, the Transnistrians did not want to become dominated by a Romanian state, while the Moldovans did not want to lose the heavy industry, and the supplier of 90% of the country’s electricity. There was a bloody conflict from 1990-92  followed by an uneasy peace. The status of Transnistria is basically guaranteed by a Russian army contingent stationed there, but Russia itself shies away from recognising it as a state. There is now relatively free movement across the border, and the majority of the Transnistrian population actually carry Moldovan passports, (they cannot travel without them as the Transnistrian passport is little more than waste paper). Accusations abound about the running of Transnistria, including the influence of Victor Gushan and his Sheriff group, (the country’s second biggest company, after a steel mill that relies on Russian orders). However, most of these accusations come from Moldovan sources, and really need a more thorough examination then they have received. The Sheriff group is the country’s biggest retailer, controlling supermarkets, banks, and petrol stations while the group includes a TV station as well. Moldova is however, keen to join the EU  either on its own or by becoming part of Romania again and this ambition cannot be realised until a solution to the Transnistrian problem is realised. If Moldova agrees to jettison Transnistria, then it is unclear whether it would join the list of mini-states, or if it would itself merge into Ukraine. Just to confuse matters further, another even smaller area of Moldova, Gagauziya (in the south) also would like to break away. Gagauziya has one football team in the Moldovan League  promoted last season and now bottom of the top division – and have also entered a team into a non-FIFA board competition in Northern Cyprus. Transnistria has four teams in the Moldovan National Division, with Sheriff having won the title for ten successive years. The other three are FC Tiraspol, Dynamo Bender, and current league leaders Istra-Stal Ribnita (in the north of the country). From what I can see, the Moldova-Transnistria situation may well be left for some time. It can be resolved in one of two ways. If Moscow were to give up support for the breakaway state, and withdrew its armies, then there would not be little to stop Moldova asserting power  but the consequences would probably be bloody, and could well be followed by long running terrorist resistance. The other solution is for the rest of Moldova to decide that joining Europe is more important than keeping all the territory. If Moldova ceded control (in return perhaps for guarantees over electricity, etc), then there would be little in the way of the country joining the E.U or merging with Romania. Tiraspol is neither a big, nor a spectacular city. It will never be one of the world’s great capitals, but it is functional. It has some wide thoroughfares, often lined with trees and other greenery, it has parks. It has a central church, and unimpressive government buildings. 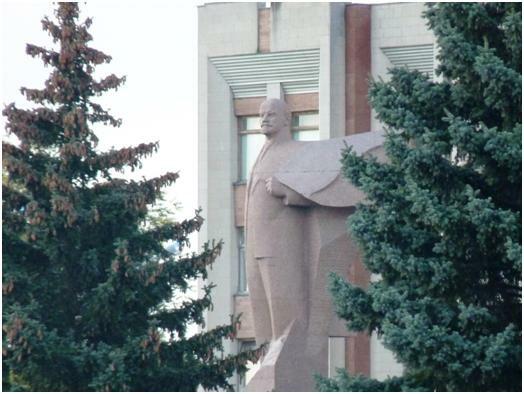 One of these has a fine statue of Lenin outside  one of the few reminders of soviet style memorials, and as such an item that should have a preservation order on it. As dusk started to fall, we made our way back to the stadium. We had time for the walk (around 90 minutes) from the centre as UEFA fixed the kick off at 22.05 local time. Although the streets are all lit, in places the main footpath runs the other side of trees, and is in the dark. The footpath is also in places uneven with gaps in the tarmac giving way to mud and puddles. It is no wonder that one of the better selling Sheriff club souvenirs is a torch in club colours. The stadium complex is on the edge of the town, but can be easily reached by trolleybus or microbus. Cheap taxis would take you there from either the centre of town, or from Bender. 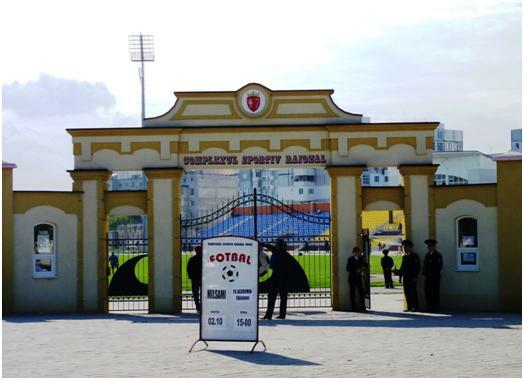 Any groundhoppers trying to go to Tiraspol may want to consider that most of their games are later in the day then the rest of the Moldovan League, and between Dynamo Bender and Tiraspol, one does not need a border crossing  so a double header is possible when kick offs are three hours apart (at least by taxi). The stadium is a very modern complex, consisting of two football stadiums a sports hall and an unfinished hotel complex. Both of the stadia have floodlights and stands and would be good enough for league games. It is used by two teams, Sheriff, and FC Tiraspol. 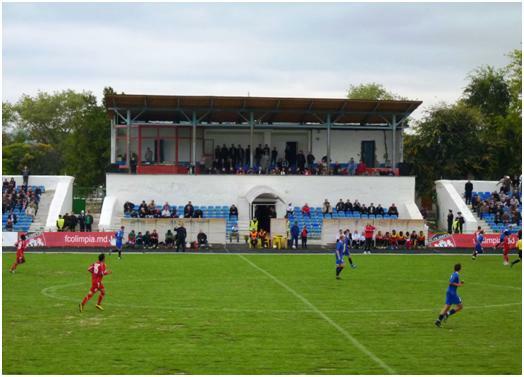 The matches never clash, and both tend to late kick offs  but there are no signs to show whether any league matches may be played on the smaller stadium. The group photo of the Sheriff team used in the programme did appear to have been taken in the smaller stadium, but this only means that it may well be used as a training venue. The main stadium is a very functional affair with two near identical sides, and two near identical ends. The roof is at a uniform height all around, and appears as if it would provide protection in poor weather. The end stands are raised above ground level, and have netting between stand and pitch, but this did not stop Kiev fans from lobbing flares onto the pitch, or one fan from actually entering the playing area (from where he was apprehended and taken away). 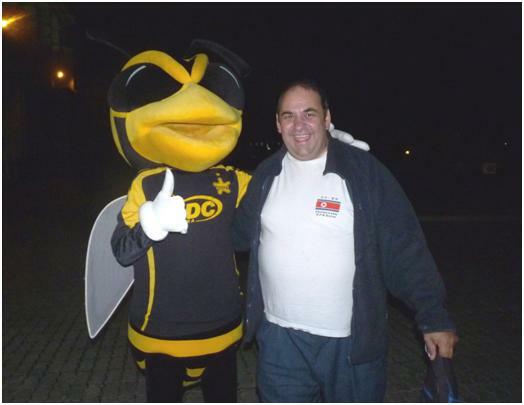 Outside, we met the club mascot, supposedly a bee, (due to club colours of yellow and black). We also met a fan who had come from Odessa, 100 miles or so away (and in the Ukraine). Although he was supporting Kiev, it was not his first time here. 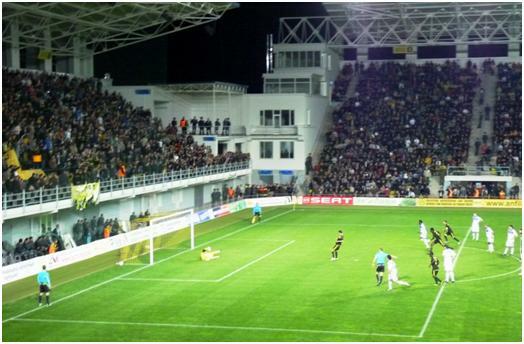 Odessa is nearer to Tiraspol than Kiev, so this may be his closest venue with European games. He told us the stadium was around five years old. We also briefly discussed the local politics, and our new friend then translated some comments I made when we were accosted by a roaming TV camera crew. I never found out if they were Transnistrian or Ukrainian, or if they used the footage. My comments were diplomatic, praising the stadium, the friendliness of the people, and promising to support Sheriff, (well, diplomatic assuming it was a local TV crew). The Sheriff XI on the pitch contained only one local player (and he only gets listed as Moldovan  I have been told that he was actually born in Georgia). The other ten starters came two each from Brazil, Serbia and Burundi, one each from Bulgaria, Bosnia, Russia and Senegal. There were three Moldovans on the bench (two of which were from Transnistria), but they (and a Serbian) stayed there. The subs that played came from Latvia, Slovenia and Serbia. By comparison, six of the starting line up for Dynamo Kiev were Ukrainian, supported by a cast from Finland, Croatia, Serbia, Morocco and Nigeria. They left three Brazilians and two Ukrainians on the bench, playing only two subs, from Ukraine and Macedonia. The game started with Dynamo playing the more assured football, but they fell behind to a freak goal in the 8th minute. The goalkeeper attempted to kick a clearance and the ball hit Erokhin who was as surprised as anyone when the ball looped over the keeper and into the net. Still, for the next half hour, the visitors showed enough to say that they should eventually turn chances into goals, but then as the ball sailed harmlessly over the Kiev area a hand flashed up and helped the ball on its way. Centre half Yevhen Khacheridi was the guilty party, and the penalty meant the score was 2-0 to the home team. The visitors lost heart after this, while the home team rarely looked like adding to the scoreline without actual assistance from the visitors. Sheriff Score from the Penalty Spot. There were sizable contingents from each side determined to sing through the game, with at least 1000 travelling fans in the crowd around 14,000. 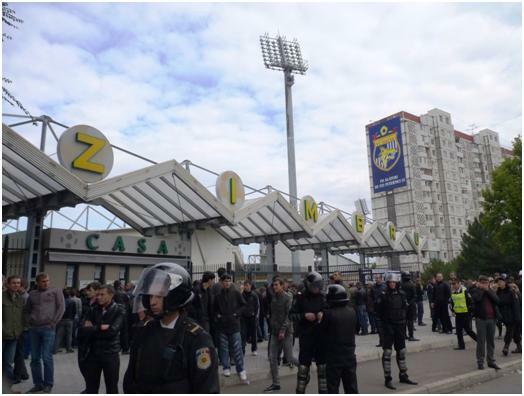 One third of one end had been fenced off, presumably for tickets sold in Kiev, while the rest of the end seemed to have a majority of blue colours, the yellows of Sheriff gathering at the opposite end. The flares late in the game came from the fenced off section, and if any action is taken, then Sheriff will be criticised for inadequate security, as well as Dynamo as it was their fans. Coming away from the ground, there were queues of traffic in both directions, while two trolleybuses were operating late. 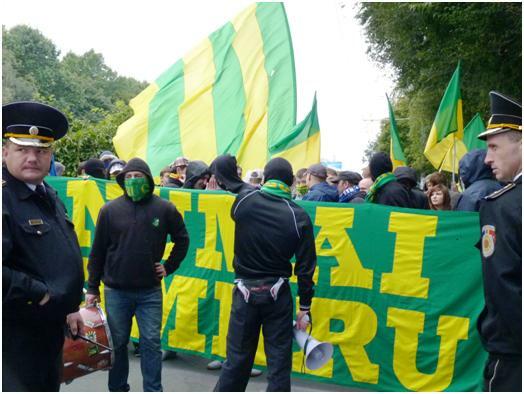 Even when we reached the border around 1 in the morning, we had to queue for around 20 minutes  a sure sign that a fair portion of the crowd had crossed the Moldova-Transnistria border to see the game. The guards even left the entry paper with our passports (as souvenirs of the visit). This was the only souvenir we found  Tiraspol is not known for tourism, and we saw no postcards or other souvenirs at all. One final point, the match was the first time a Moldovan or Transnistrian had beaten a Ukrainian side, and this was too much for coach Valery Gazzaev. Having seen Kiev miss out on the Champions League for the first time in 5 years, Gazzaev offered his resignation when his team failed to beat BATE (from Belarus) in their first Europa League game. While it was not accepted then, this further failure meant that his tenure at the club had less than 24 hours to run, by the time he left the stadium. Not all the fans agreed that the eclipse of Dynamo as the Ukraine’s leading club is down to Gazzaev, who has previously coached CSKA Moscow to win the UEFA Cup. A poster briefly unfurled in the second half of the game read “We now have nothing left but our memories. Thanks a lot Ihor!” A reference to club chairman Ihor Surkis. Further bad news followed for Kiev when Shaktar beat them three days later to take a five point lead at the top of the league table. You are currently browsing the Football Shaped blog archives for October, 2010.